What's on tap at Ommergang Brewery. 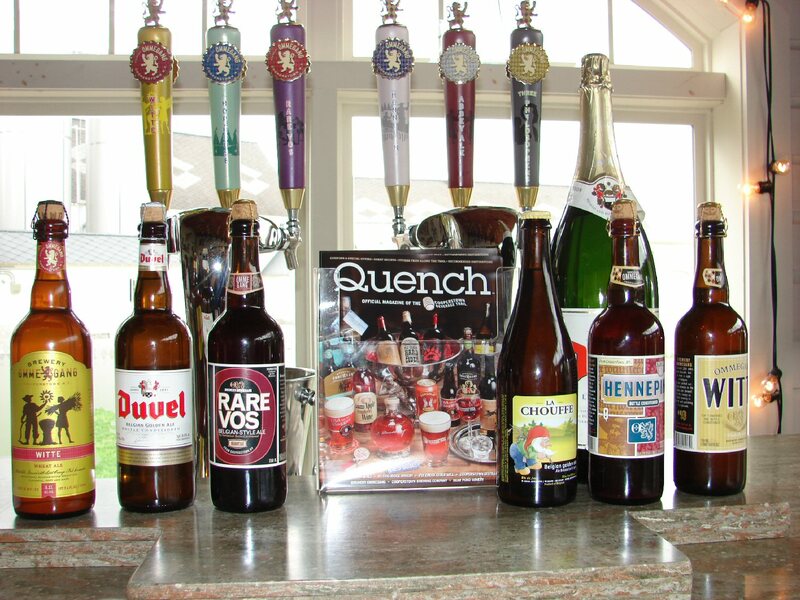 Last week I asked: Where can you tour Ommegang Brewery? What’s on tap at Ommergang Brewery. 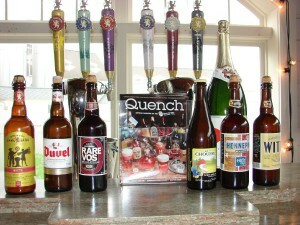 When John and I were in Cooperstown, we visited the Ommergang Brewery, which is part of the Cooperstown Beverage Trail. It is New York State’s first official cuisine trail. Ommergang Brewery is located in a large building that is reminiscent of the breweries in Belgium. The tour of the Brew House points out the attention to detail in the production of Ommergang beers. The water comes from aquifers located on their property. 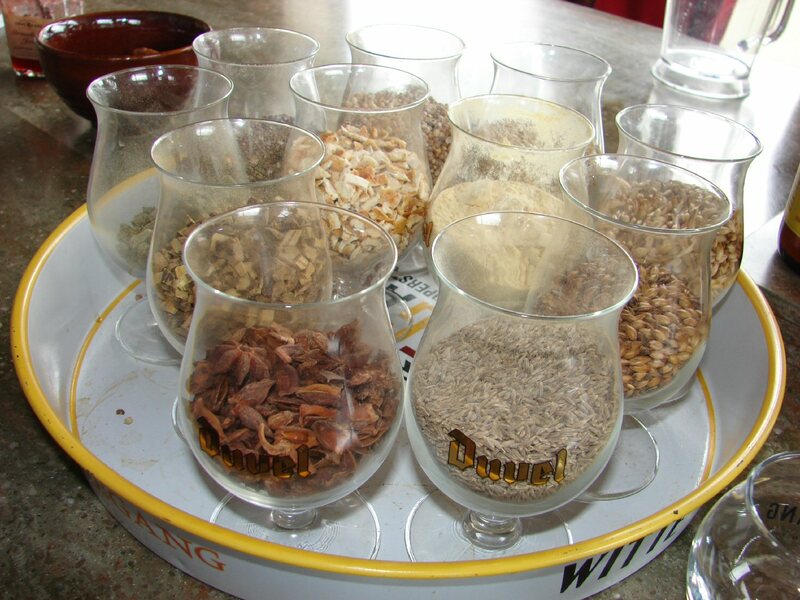 Special ingredients for special beers. At one time, New York was a leading producer of hops, in fact, at one time the area was the hops-growing capital of North America. The state doesn’t produce enough for the brewery so the hops they use are from Slovenia, Germany and America with special malts from Belgium, Germany and America. I was surprised by the variety of spices they use – paradise, ginger, star anise, cumin, coriander and orange peel. Actually the Brew House is the kitchen of the brewery. Beer is not made in the Brew House – the “wort” is. The beer is produced in the large, metal vats outside the Brew House. After the tour we went into the bar at Café Ommergang where we enjoyed a tasting. Our guide explained the different brews and the spices that give the brews a unique flavor. 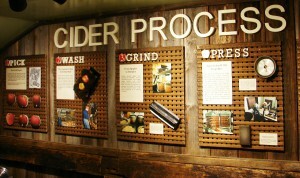 Besides breweries, the Beverage Trail includes wineries, a distillery, and an historic cider mill. 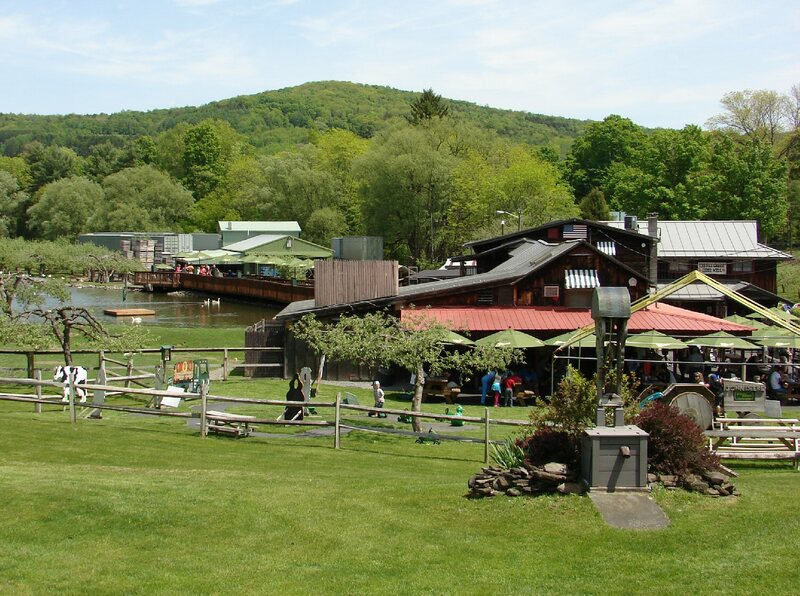 The Fly Creek Cider Mill is a destination in itself and obviously a local family favorite. They have been in business since 1856 and have over the years grown and diversified. 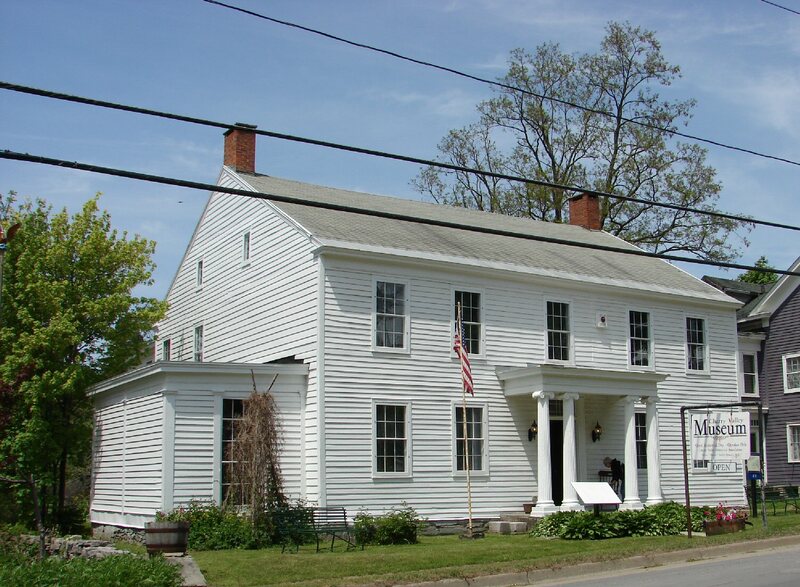 Today the mill, besides making its renowned hard cider and selling apples, has a Marketplace. They have partnered with New York State’s Pride of New York so the store features many items grown and produced throughout the state from pure maple syrup to fresh cheese curds. There are plenty of foods to sample. In the restored barn adjacent to the mill is their restaurant and bakery where we bought their Cider Mill donuts to save for breakfast and pulled pork sandwiches ending with ice cream. Nestled in a quiet town the Mill has a picturesque setting with a pond, ducks and geese. I’d like to be there when the make the cider – the old fashioned way. 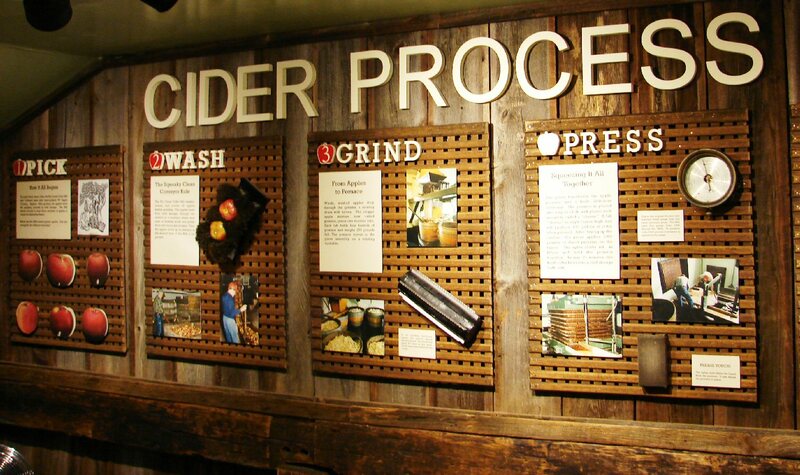 How do you know when they are making cider? John and I drove around the bucolic countryside. 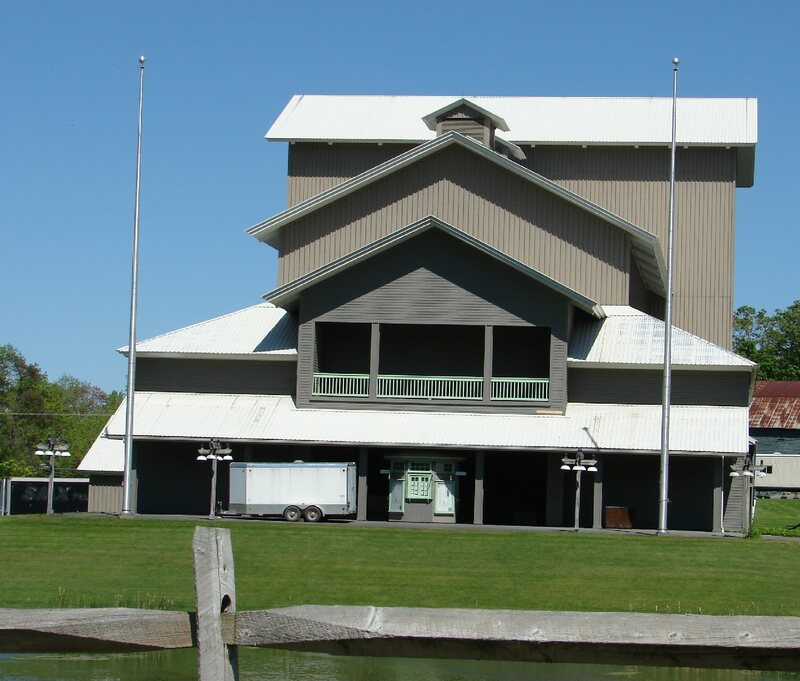 At the north end of Otsego Lake is Glimmerglass State Park with hiking trails and campsites plus the historic Hyde Hall, a National Historic Landmark. The neoclassic country mansion was built between 1768 and 1835. It is on NYS’s Haunted Trail. 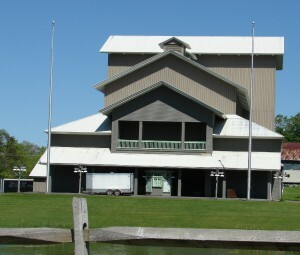 Sadly, there was not a presentation at the Glimmerglass Opera while we were there. We had heard wonderful things about it. 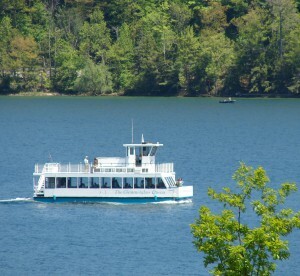 The other thing we missed was a boat tour on the Glimmerglass Queen. But, the drive around the lake was beautiful; luckily the forest on the east side of the lake has remains untouched. Upon leaving Cooperstown, John and I drove north to Cherry Valley and stopped at their museum. The museum has an extensive collection but I most enjoyed the informative video. This quiet little town is an example of survival. Twice in the 1700s, most of the residents were massacred but the survivors rebuilt their community which was once a popular stop for those going west. The Erie Canal and then later the NYS Thruway bypassed it so now it is a quiet example of Americana. Trivia Tease™: Where is the perfect place in Stowe for a getaway?